You’ve said your sweet goodbye to 2014, a year marked by beauty trends like pastel extensions, bold brows, lobs, and chocolate-brown lipstick, and now that January is upon us, it’s time to start mapping out your must-try hair, makeup, and nail looks of the new year. At this point, you have precisely 364 days to start testing out new, intriguing, and predictably huge beauty trends of 2015 and crossing them off your bucket list. Because spending every day in a topknot and pink gloss isn’t exactly groundbreaking or taking the bull by its horns in the least bit, we rounded up a blueprint of 20 new trends, from funky ponytails to graphic liner, for you to rock in the new year. Get creative with your eyeliner. Try thicker lines or create a graphic cat-eye using wide, felt-tipped pencils, and lots of electric color. 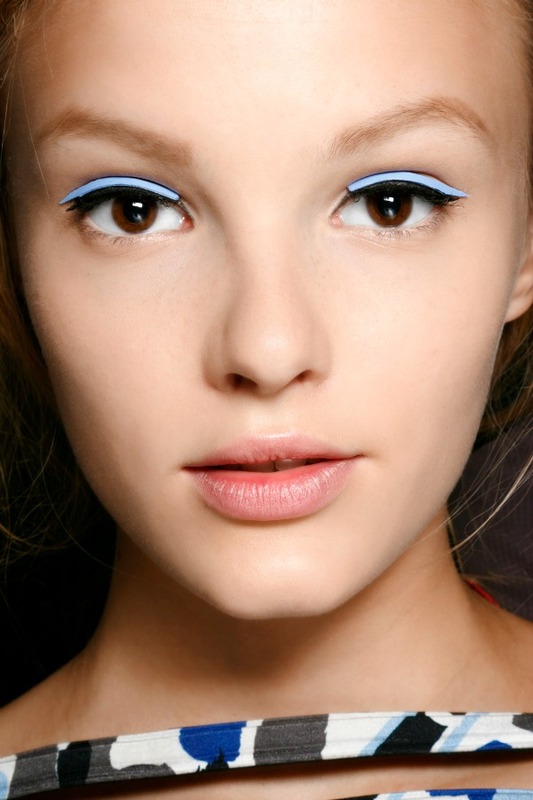 Models at the Fendi, Max Mara, and Honor Spring 2015 shows walked down the runway with electric blue liner, making us rethink the color that so defined the 80s. Instead of a steady, full line that spans the entire length of your upper and lower lash lines, draw a short line in the middle of each like the doll-like beauty look at the Dior Pre-Fall 2015 Show. Instead of coating your entire nail with polish, try out the negative space nail art trend that concentrates on only painting a portion of your nail with color or art designs. Need some ideas? Go for a French manicure for a subtle approach or an unpainted nail with super thin linear designs in dark colors. Amp up your smokey eye by lining both your upper and lower lash line with smudged black eyeliner and then heavily applying a charcoal grey or dark black eyeshadow. During the Spring 2015 shows, designers chose low, sleek ponytails tied off at the nape of the neck to accompany their new collections. Whether you have straight, wavy, or curly hair, this might be the easiest new trend of 2015 to try. When springtime finally hits, break out the pastel palettes and paint your lids in light, feminine colors. Take the trend a step further by applying the shadow or hair chalk over your brows like the models at the Marie Antoinette-themed Badgley Mischka show. The ballerina bun is back and better than ever. Try out a super smooth chignon or braid sections of your hair and twist it back into a classic bun. You’ll be ready for any occasion, and better yet, this look keeps your hair neat and out of your face—a major plus on those windy winter days. Don’t discard the barrette. It will dress up that half-up hairstyle that you’re still unsure of. For grown-up inspiration (that won’t look anything like your fourth grade yearbook picture) reference the beauty look from the Spring 2015 Céline show, where a section of the models’ smooth hair was tastefully pinned back with a circular gold barrette. We’re not talking about floral crowns à la Coachella, but that’s not to say we wouldn’t love to see that trend pop up all over again. What we’re referring to is the delicate, slightly undone coifs that were accessorized with red flowers at the Dolce and Gabbana Spring 2015 show. Kendall Jenner made it work, and so can you. For a bold lipstick look that isn’t red or hot pink, try out a wine-hued or darker vampy hue in a matte or shiny finish. To add some dimension to your hairstyle, twist 2-3 inch sections of hair on either side of your face and pin them back. You can also add in these pretty details to updos. Match the color of your nails to your lipstick for a coordinating look. Messy waves are easier to achieve than perfect tendrils, are we right? They just so happen to be one of the biggest hair trends of 2015. Loosely braid your damp hair before heading to bed. When you wake up, undo the braid and scrunch your hair with a setting and texturizing spray for the relaxed look. Whether you’re lining only the inner corner of your eye or your entire lower lash line, white eyeliner is an out-of-the-box way to brighten up your entire look. We’re not ready to say goodbye to metallic makeup just yet. Designers really played up this crushed metal during the Spring 2015 shows. Some designers chose to have their models’ entire eyelids painted in gold, silver, and bronze, while others only had their models walking down the runway with metallic liner and little to no other makeup. We’ll be honest—we loved both. It’s edgier than a side-part and looks great with super straight or wavy hair. Use a comb to create a straight and even part and keep it in place with a light, flexible hairspray. You don’t have to stress about your braid not staying neat and in place all day. 2015 is all about the undone braid. Create a standard three-strand braid and give it some texture by holding it at the bottom with one hand and using the other hand to push the hair up. You can also try out a side fishtail braid and pull out the strands around your face for a soft look. Put your hair up in hot rollers while doing your makeup in the morning. Take them out, flip your hair over, spritz in some hairspray, and your glam, Hollywood look is complete. For inspiration, check out the beauty look from the Spring 2015 Jenny Packham show. Give the “no makeup makeup look” a dewy glow by dabbing on lip balm, Vaseline, or a light layer of Aquaphor to your lids and on your cheekbones. Finish it off with two coats of voluminizing mascara and you’re set!